You'll be £12.99 closer to your next £10.00 credit when you purchase Assault on Normandy - Gold Beach. What's this? Order within the next 4 hours, 57 minutes to get your order processed the next working day! 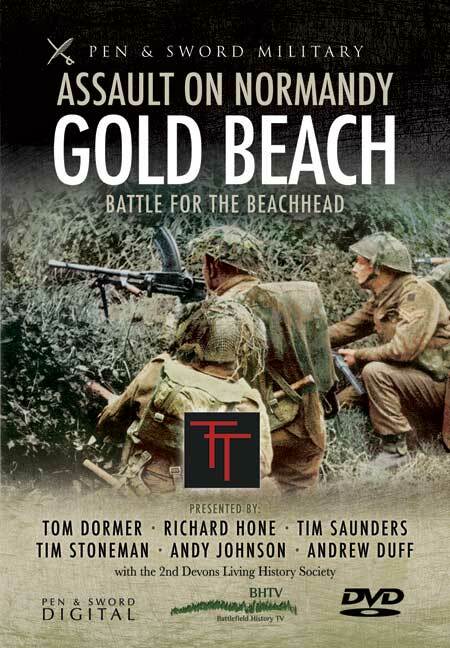 GOLD BEACH - BATTLE FOR THE BEACHHEAD is the second DVD covering this operation in detail and part of the Assault on Normandy series from BHTV and Pen & Sword Digital. While Part 1 examined the combined weight of naval, air and land forces and the tactics they used to break through Hitler's vaunted Atlantic Wall to seize a toe hold in Festung Europa, this DVD focuses on the veteran 50th Northumbrian Division as they fought their way inland to establish a beachhead to survive the inevitable German counter-attack. 69 Infantry Brigade had a highly successful landing and now had to fight its way through layers of German defence to its objectives eight miles away. While clearing through German held villages and defensive positions the veteran warrior, Sergeant Major Stan Hollis, continued the actions that led to him receiving the only D Day Victoria Cross. Meanwhile, 231 Infantry Brigade, whose landing had been badly disrupted, were attempting to recover the situation and were fighting through German strong points towards Arromanches and the enemy held Point 54 ridge. These battles lacked the coordination between infantry and tanks achieved by 69 Brigade and were up against field grade German infantry. Hours behind schedule, the village of Ryes was taken. This allowed the much delayed second wave consisting of 56th and 151 Infantry Brigades to deploy and exploit the early successes, reaching the outskirts of Bayeux by dusk. Meanwhile, in the west, the hard pressed 231 Infantry Brigade and 47 Commando continued its advance through enemy held territory to Port en Bessin, while the Hampshires and the Devons fought on towards Arromanches and the Longues sur Mer Battery. 50th Division had the most extensive D Day objectives and ultimately achieved more than any other Allied Division on D Day. Complimented by maps, photographs and diagrams, the BHTV team of historians and battlefield guides explain the momentous conclusion to the Gold Beach campaign, making this an ideal purchase for all military enthusiasts. Presented with the usual authority, accuracy and attention to detail that we have come to expect from Battlefield History TV, with a number of expert historians walking the ground and describing events as they unfolded, using photographs, archive footage and individual stories to bring these actions to life. The knowledge of the contributors is undoubted... a good DVD to watch before a trip to Normandy.